Fundraising events allow you to raise money towards your goal while having fun, engaging your supporters, and increasing your impact. 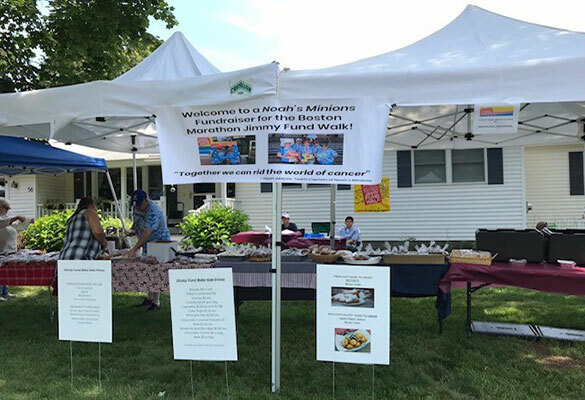 The Jimmy Fund Walk staff can help you plan a successful fundraiser by providing resources and materials such as banners, lawn signs, flyers, and more. Love to workout? Family owns a pizza shop? Utilize your resources and interests and have fun! Don’t forget to check out our “Fun Ways to Fundraise” guide for additional creative ideas. The first step in getting started is filling out an event planning form as part of our event approval process. Leave your contact info below, and a member of the Jimmy Fund Walk staff will reach out to assist you. Our annual Slow n' Steady Bake Sale is a 100% family run fundraiser. My grandma and I bake over 1,000 desserts after school. We sell everything from cookies and bars to homemade pies, French macarons, and three-layer cakes! We even make fried treats right in front of the customers eyes! We consistently raise around $3,000 and ALL the proceeds support our walk. It’s a great event for a great cause!